The Props we depend on – are they Necessary? After work last night, I played the couch potato. Hypnotized, I watched colorful commercials spin their magic only to repeat themselves every 10-15 minutes. One central theme seemed to stand out. If you’re alive and well, you should be on the fast track to success using the latest technology to speed up your dreams and luxuriate in wealth. We eat, we sleep, we work, and if we’re lucky we play. When we’re sapped of strength, we veg out in front of a T.V. set or check out text messages while trying to stay abreast of the latest trends on Facebook and Twitter. Keeping up is as important to a career as staying informed. If we’re not moving forward, we’re sliding backward. Wherever we are, at work or at home, phones are ringing, horns are honking, traffic is rushing, and the urgency of life attacks us on all fronts. Caught up in today, yesterday is a blur. We worry about lack of sleep, or the forbidden foods we eat as we grab and run. “Go, go,” we urge our children; “We’ll be late!” The clock waits for no one. If we lag, life speeds ahead of us. “Snooze, you lose,” we’re reminded at each turn. Jump in. Hang on. Cut in. Elbow your way to the front. Before long, assertiveness turns to aggression and we’re off to the races battling other people for our small space, our tiny footprint on the planet. We feel insignificant and overlooked. We’re ready to fight or scream, or come to a screeching halt! What if we did? What if we postponed a meeting? Were late posting on a blog? Slowed down our efforts long enough to notice the people we care about? I can almost guarantee that the world will not notice your feeble efforts at punctuality. And people will not see that your blog is two days late because they’re too busy working on their own. What if your numbers do slump slightly? What will it matter ten years from now if you lost two followers? What if you refused to work on weekends? I’ll tell you what will catch the attention of the important people in your life. They’ll see that you’re less on edge. Your children and sweetheart will relax when they feel your tension melt away. Instead of watching them grow apart from you influenced by a web of strangers, they’ll find out how life is supposed to be lived. They’ll learn how to set their own priorities and how to set limits on their appetites and passions just by watching you cope. Instead of rebelling, your children will respond to the new you! 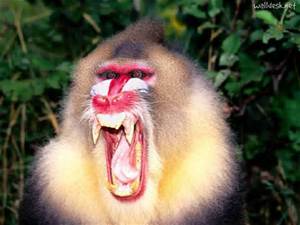 Habitual yelling and anger can be replaced with laughter setting a tone of patience and compassion. No longer will you resent their demands because you’re too busy. You’ll trust in yourself and in your God trusting that “things will work out for your good.” If you do your part, your family will follow. Strength and power come from within. When family members stand together and support one another, the family unit is stronger. Remember when Forrest Gump’s leg braces shattered and fell off? He discovered that he didn’t need crutches to live a full and successful life. Once we realize that we can achieve our dreams without relying on the false crutches that society proclaims we need, the faulty support systems of the world explode and fall away. What we are left with is a strong inner core that will see us through any crisis. 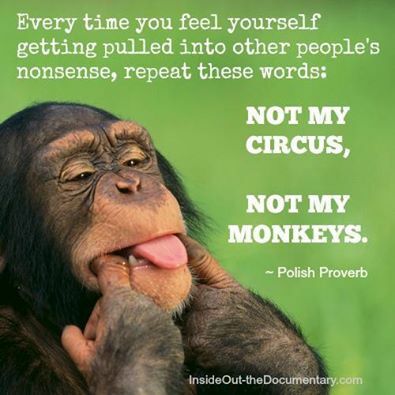 Not my circus; not my monkeys… I’ll have to say that all day at work. I rather like it! I couldn’t resist using it in this blog. Irresistible! Glad you enjoyed it!